cutest girls, I love Lola's expressions! Can't wait to see you Langs next week! hey that cardigan looks familiar.... was that one of KK's??? Oh I love these. I want to print them for my wall! So cute. They are so adorable! Love the red and pink on them. Cutest girls ever. Happy Valentines day! These pictures are so adorable! I love these girls. And I loved my Valentine from Ivy!! 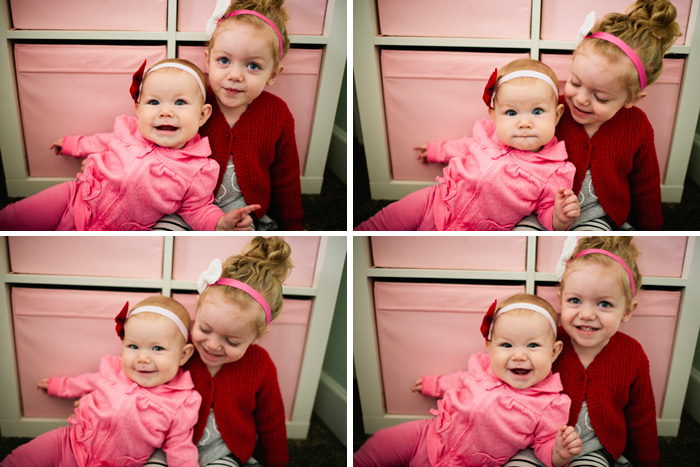 Sisters in pink - what could be cuter! Adorable little babes. Happy Valentines Day! lola is the most expressive baby! her faces are just priceless!